After the English victories, Sir Bertine held estates in France and the titles Viscount Briquebec of Normandy and Lord of Hambye. When the French regained much of their land, he returned to England for the last time in 1450 and went to live back in his native Lancashire. He had built his new Hall at Entwistle, later called either Lower House or Lower Crowtrees, now submerged under the Wayoh Reservoir. His loyalties were with Henry VI and the king’s principal ally, the Duke of Summerset. It is said by some that both the feeble King Henry VI and his Queen, Margaret of Anjou, visited Sir Bertine at his home in Entwistle around this time, to seek his advice and counsel. The conflict that divided the English aristocracy for 3 decades (1455-1487) was later known as the “Wars of the Roses”. 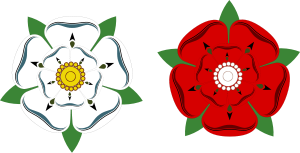 This phrase referred to the red rose to signify Lancastrian and the white rose to signify Yorkist. This notion was later given wider credence by Shakespeare in his historical plays. The outbreak of open warfare between Lancastrians and Yorkists came about when Henry VI, Duke of Lancaster, recovered his senses after a severe mental breakdown following England’s humiliating defeat in France. The defeat was blamed on the weak and incompetent leadership of Henry and his chief ally, Edmund Beaufort, the Duke of Summerset . During the King’s illness, England had been ruled by a council of nobles led by a Protector, Richard, Duke of York. He was the richest magnate in the land and, many argued, the rightful heir to the throne. However, Henry’s French Queen Margaret herself aspired to be Protector and hated the ambitious Richard of York. She wanted her newborn son Edward to be acknowledged as heir to the throne . However, there was uncertainty as to whether Henry really was young Edward’s father! Richard Duke of York despised the Duke of Summerset because of favouritism shown him by the King. He thought that Summerset was largely responsible for the debacle in France and should be removed from his position and tried for treason. Richard had the support of the earls of Salisbury and Warwick, both members of the powerful northern Neville family. Queen Margaret, on the other hand, supported Summerset and gained two important allies for the King, the influential northern noblemen, Lord Clifford (Thomas Clifford, 7th Lord of Skipton) and Henry Percy, Earl of Northumberland. The Percys and Nevilles had been feuding for generations. Skipton is only a day’s horse ride from Entwistle, so it is highly likely that Sir Bertine Entwistle and his supporters were part of the Clifford retinue, itself a section of Northumberland’s army. Richard of York now found himself losing influence as Henry and Margaret regained power and, expecting the worst, he withdrew to the north to meet his supporters and muster his men. Richard’s suspicions were confirmed when Summerset called a “great council” in Leicester (packed with his own supporters), where presumably he intended to enforce Richard’s submission to the King. Instead of attending the council meeting, Richard marched south in full force and at full speed to encounter the royal party at St Albans , on 22 May 1455. Henry and his Lancastrian followers, knowing the support that the Yorkist Richard might muster in London, had no choice but to march to meet Richard’s army, at the neutral and unsuspecting town of St Albans. The Lancastrians including Summerset, Northumberland, Clifford and Sir Bertine  among many other nobles and ranks barricaded themselves in the streets of the town of St Albans, with the Yorkist army (3,000 troops to the 2,000 on the Lancastrian side) ranged in the fields outside. Richard and the Yorkists protested their loyalty to the King but insisted on the hand-over of Summerset and his henchmen. This the Lancastrians refused after four hours of negotiation. They emphasised the presence of their monarch by hoisting the royal standard. Richard retorted by storming the barricades. Whilst the bulk of the Lancastrian force were surprised and fully occupied by the speed of Richard’s attack, Yorkist Warwick took the reserves and broke through into the main street behind the Lancastrian fighters, taking a path through the back lanes and gardens. This manoeuvre so surprised the Lancastrians that the whole army soon fell. The battle became a rout and most of the nobles on the Lancastrian side were slain, including Summerset who is said to have been cut down by Warwick himself. Henry was spared and Richard regained his Lord Protector role. Most of the nobles killed on the Lancastrian side found their last resting place in the Abbey Church (Cathedral) at St Albans, whilst just three nobles were taken to St Peter’s Church – Bertine was one. Sir Bertine Entwistle was buried along with two of Northumberland’s retinue, Ralf and Ralf Babthorpe (father & son)  in the crypt of St Peter’s. In the battle, 800 men were said to have fallen on the Lancastrian side including As well as the Duke of Summerset, the Earls of Stafford and Northumberland, Thomas, Lord Clifford of Skipton, Sir Robert Vere, Sir William Chaimberlain, Sir Richard Fortesque, Sir Ralf Ferriers, Sir Bertine Entwisle and many more esquires and gentlemen were killed. Alas, the memorial is no longer in place, lost when the church was repaired after a fire, though it is thought the three bodies remain under the nave floor. 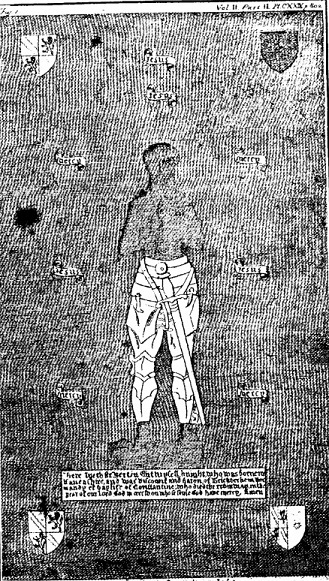 A drawing of the original brass is reproduced in Grimshaw’s Entwis(t)le Family. The author visited St Albans in the summer of 2001. It is a fascinating and beautiful city and of particular interest to Entwistles – well worth a visit. Although nothing remains to mark Sir Bertine’s final resting place it’s fascinating to see St Peter’s at the top of the main street, the local museums, and just to stand and look at some of the buildings which were actually in existence at the time of the battle – to think that Bertine actually looked at those self same buildings on that fateful day in 1455 – though granted, he probably didn’t have a great deal of interest in the architecture, having a few more pointed and pressing things on his mind ! Both the Earl of Northumberland (Henry Percy) and the 8th Lord of Skipton (Thomas Clifford) had much in common with Sir Bertine Entwistle and were no doubt well known to each other. Apart from their geographical (north of England) links and their allegiance to the Lancastrian cause, all three families had strong links through the occupation of France, all three had close ties to Henry V himself, and of course, all three were killed on the same day at St. Albans. John Clifford (1388-1422), Thomas’ father was probably well known to Bertine. He took part in the siege of Harfleur and the Battle of Agincourt and he received the surrender of Cherberg. He was killed at the siege of Meaux in 1422. Henry Percy (1414-1455), like Bertine, was educated in France and was a personal friend of Henry V. Percy was King Henry’s General Warden of the Marches throughout his reign and the French campaigns, through to the early years of Henry IV. He was no doubt well known to Bertine Entwistle. The Babthorpe family were probably long-time associates of the Entwistles. The online Agincourt Honour Role lists Robert and Thomas Babthorpe indicating that the Babthorpe family fought at Agincourt along side Bertine, listed as France, B’tram de, and probably Bertine’s brother William ( Entwessell, William). Like Sir Bertine, Sir Robert Babthorpe was granted estates in France following their success at Agincourt. “During the War of the Roses (1455-85) Dunstanburgh was a bastion of the Red Rose of Lancaster, as could be expected – its constable, Sir Ralph Babthorpe was, in fact, killed at the Battle of St.Albans in 1455. Even after the disastrous Battle of Towton in 1461 the castle remained a centre of Lancastrian operations and, indeed, hopes. In 1462 Henry VI’s queen, Margaret of Anjou, landed in Northumberland with a considerable Lancastrian force and is said to have used Dunstanburgh as her base for operations in the North over the ensuing months. Having occupied Dunstanburgh, Bamburgh and Alnwick the Lancastrians were thereafter thrown back on the defensive as the Yorkists laid siege to all three in November 1462. Dunstanburgh was the last to fall, with honour, under a huge 10,000-man siege; Sir Ralph Percy swearing allegiance to Edward IV and continuing to hold the castle for the Yorkists. Come 1463 and Sir Ralph – in typical Percy style – once more switched sides only to meet his death in defeat at the Battle of Hedgeley Moor in April 1464. After another Lancastrian reverse at the Battle of Hexham in May, the Earl of Warwick took Dunstanburgh for the Yorkists for the second time on 24th June 1464″ From Issue 3 of the North-Easterner – Winter-Spring 1995.